What level skier are you? You have been skiing for a while at Tahoe ski resorts. But do you really know how good you can ski. Can you accurately pinpoint your ability level? The answer for many people is no, they can’t really access their skiing ability. 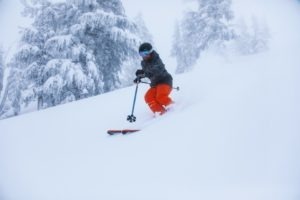 Level 6 skiers typically utilize their poles to initiate turns and are often interested in learning and advancing to more challenging terrain. Most skiers either classify themselves as a beginner, intermediate or expert. However, there are more than three categories that should be used when ranking one’s skiing ability. Below is a list of skiing levels – from 1 to 9 – regarding skiing capability. These skiers are first timers that have never skied before. Hopefully they are taking a lesson from a trained professional and not their friend or a parent – which is usually a big mistake and never advisable. This category is the cautious novice who utilizes the “snow plow” (wedge) exclusively in turning in either direction and are able to stop successfully without falling down. But linking turns smoothly is difficult. Level 2 skiers have typically skied only once or twice before. Yet some have gone more frequently and are a little too timid to make any significant progress. These skiers are confident novices that are able to make competent stops and execute round snow plow turns on beginner trails that aren’t too challenging. This skier is a cautious intermediate who can link turns, but remains reluctant in the speed department and prefers staying at very moderate, safe speed. Level 4 skiers still tend to use a small wedge and their skis may even be parallel at the end of the turn on the easy green runs and moderate intermediate trails. Level 4 is a transition level, one where skiers are beginning to ski advanced to moderate intermediate runs. This intermediate skier maintains confidence on easy blue runs and can keep their skis primarily parallel. However, at times they fall back to using the wedge to begin a turn or to stop when on more difficult runs. Level 5 skiers remain cautious on intermediate trails that are either too steep or too icy. This is a confident skier who is regularly making parallel turns on blue runs, but doesn’t ski many advanced trails that provide more challenge. Level 9 skiers are the experts, the skiers who we all long to be and admire at the ease in which they master any type of terrain. This skier is under control, can make parallel turns and ski very well on intermediate runs. Level 7 skiers are proficient at controlling their speed and demonstrate rhythm on moderate black diamond trails. But they are also looking to take on more challenging terrain and seek to improve their overall proficiency. The Level 7 skiers are adept at adjusting to the size and length of their turns and are learning to master a variety of different types of terrain and snow. 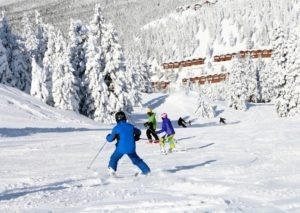 This level includes the excellent skiers that demonstrate good technique on any type of terrain and snow conditions. They are skiers who can handle moguls, utilize their poles properly and know how to avoid the pitfalls that lead to numerous falls in the bumps. They can also ski black diamond trails with extreme confidence and use smooth, carved turns. These are the experts, the skiers who we all long to be and admire at the ease in which they master any type of terrain. Level 9 skiers like to challenge themselves on steep, narrow, difficult trails or tough moguls. They will aggressively take on the steeps, deep powder, or any black diamond run.